Foothills Art Center Holiday Art Market. (HART). Friday, DECEMBER 1ST pictures with Santa 4:30-6:00 pm. 809 15th Street. 303-279-3922. Miners Alley Playhouse: Thursday - Sundays. at 7:30 pm. Miners Alley:1224 Washington Avenue. 303-935-3044. A Miners Alley Playhouse Tradition! A Christmas Carol by Charles Dickens. From Scrooge and Tiny Tim to Bob Cratchit and Mrs. Fezziwig. Come Play in the Alley! North Pole Golden: US Postal Box for Santa’s letters is located at the Golden Visitors Center, 1010 Washington Avenue. Bring your letters to SANTA’S mailbox and Santa will answer them. 303-279-2282. Shop Local Small Business Saturday: Stop at Visit Golden’s Small Business Saturday Welcome Station (open 10:00 am-noon) at the Golden Visitors Center. Pick up a Shop Small tote bag and a Jingle Around Golden passport before heading out to shop and dine for the day. The Golden Optimists Annual Christmas Tree Sale: 10:00 am to 6:00 pm. US Bank parking lot at 19th & Jackson. 303-278-0541. All profits are used for the Bicycle donation program and youth programs. 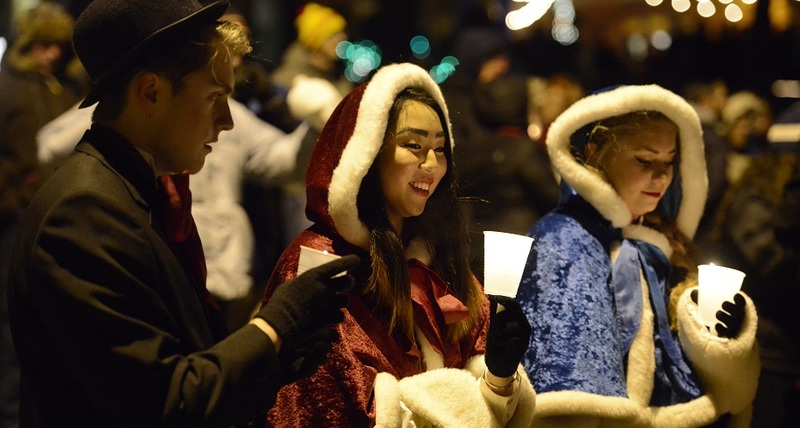 The 30th Annual Candlelight Walk: Dress festively for the Walk! Gather at Foothills Art Center, 6:00 pm, at 15th and Arapahoe Street for caroling. Hot beverages will be served by the Golden Lions Club at the top of the hill (as well as after the Candlelight Walk in the Golden Visitors Center parking lot). The Golden Chamber will be selling candles and glow sticks for $1.00. The walk will begin at 6:30 pm. After the walk, visit the Holiday Square (Visitors Center parking lot). Santa and his Reindeer will be flying in from the North Pole to help us celebrate our holiday tradition. Reindeer sponsored by El Dorado Mexican Restaurant. Ronald McDonald will be there to keep them company. Meet and greet with Ronald for photo ops, magic, and fun. Coloring books will be provided by Golden Natural Grocers. Children 12 and under can enter to win the “Light the Lights” contest by filling out an entry card available inside the Credit Union of Colorado. Mayor Sloan will draw one winning name during the week of November 27 and she will call the lucky winner to join her on the stage to help flip the switch and light up our beautiful City. The Golden Chamber’s Holiday Stage will kick off at 6:45 pm on the corner of 10th and Washington with Emcee Joe Fowler. Golden High School’s 24th Street Singers will perform under the direction of music teacher Diane Nickel. Santa Claus, Mrs. Claus, Chamber CEO Leslie Klane, City Manager Jason Slowinski, and Golden’s Mayor Marjorie Sloan, will “Light the Lights” with our sponsor, Credit Union of Colorado. After we “Light the Lights” there will be A Celebratory Moment with a small fireworks display presented by the City of Golden. Fireworks launch from the rooftop at the Golden Hotel. Golden History Museum and Park: After the Candlelight Walk at Clear Creek History Park Jefferson Country Open Space will lead an interactive activity, the Kiwanis Club is roasting chestnuts, Christmas carolers and dancers will be in the Hay Barn, the Pearce cabin will be open for visitors, and a blacksmith demonstrating his trade. At the History Museum, enjoy piano players performing cheery holiday music that visitors may enjoy while warming up. Open from 7-9 pm. Rocky Mountain Quilt Museum: 200 Violet Street, Suite 140. 10:00 am to 4:00 pm. 303-215-9001. Free gift with admission. Golden Sweets: 1299 Washington Avenue, Suite 100. 5:00 pm to 9:00 pm. 303-271-1191. Friends and Family evening. Come join us for samplings of Chocolates, Sweet Treats and Holiday Specials! All weekend long. Blue Moose Trading Company: 1299 Washington Avenue, Suite 110. 5:00 pm to 9:00 pm. 303-271-1199. Friends and Family evening. Join us for appetizers, drinks, and store specials. Golden Library: 1019 10th Street. 5:30 pm. to 8:00 pm. Enjoy cookies and hot cider, make a craft and stay for the entertainment. The Rocky Mountain Ukulele Orchestra will be playing holiday favorites and Amazing Dave the Magician will delight with his tricks. Baby Doe’s Clothing: 1116 Washington Avenue. 6:30 pm to 8:00 pm. 303-279-8100. Warm up with some tea and tap your toes at Baby Doe’s. 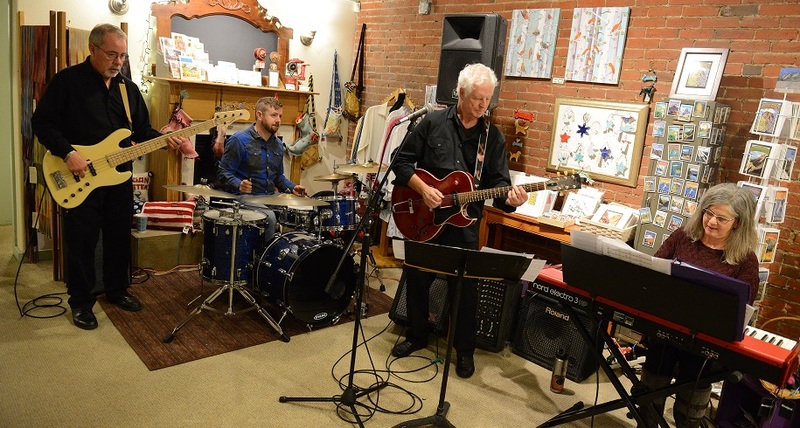 Enjoy holiday treats and live music at Baby Doe’s Clothing. We are pleased to have Fatfinger, aka Bruce Bouck and friends, here to kick-off the season. Earth Treks Golden: 700 Golden Ridge Road. 6:00 pm to 10:00 pm. 303-222-9564. The Rendezvous - Join us for a community block party! Featuring fun, friends, climbing, local vendors and free beer and snacks. Free for members! Discounted day passes will be sold during the event. Cameron’s Dragon: Parfet Park at 7:00 pm. Family Sing-Along. Gather around the Dragon for songs, instruments, and children’s musical fun. Led by Dr. Erika and Ms. Danette, local pro music teachers, and the School of Rock Denver. Traditional Ornament Signing: Golden Visitors Center. 7:00 pm. The 2017 Leadership Golden ornament celebrates the 150th anniversary of Calvary Church, established at its current location in Golden in 1867. The full-color artwork for the ornament was donated by local artist Juli Leidel. This year’s ornament is the 34th in the collectible series. Cost $10.00. dtermin21@gmail.com. These ornaments are available at Avenue Gifts, Creekside Jewelers, and the Golden Visitor Center. Jefferson County’s open space telescope presents The Mysterious Moon. Under the direction of naturalist Mike Dempsey. At 7:00 pm in front of the Golden Visitors Center visit Our Mysterious Moon. For as long as there have been people on earth, they have looked up at the Moon and wondered about its ways. Cultures, myths, even the very first telescope, have all attempted to uncover many secrets. Visit Jefferson County’s Open Spaces telescope for your own look at our awesome celestial neighbor. Rotary Amphitheatre on Clear Creek Destination Dance: will perform their holiday entertainment after the Candlelight Walk at 7:00 pm, under the direction of Collette Wagner. Winter Concert at Colorado School of Mines, Green Center: 16th and Arapahoe 7:30 pm. The 2017 Colorado School of Mines Music Program’s annual Christmas Concert will include seasonal favorites, performed by the CSM Guitar Ensemble, Symphonic Band and Concert Choir, and will include an audience/choir sing-a-long accompanied by the famous (Black Beauty) Allen Organ located in Bunker Auditorium. Admission is free and open to the public. 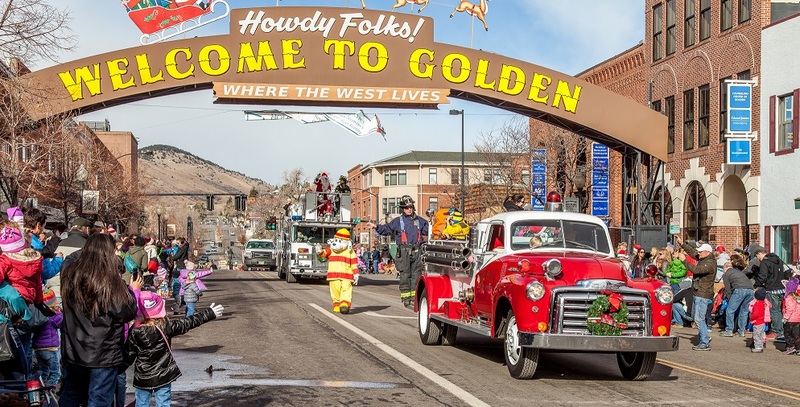 Olde Golden Holiday Open House: Historic Downtown Golden, South Golden Road, and North Golden. 10:00am to 6:00pm. (hours vary). The following merchants in Golden will be participating in the Holiday Open House by extending their hours and will be offering special sales, refreshments, and entertainment for your holiday shopping pleasure. For more info go to GoldenChamber.org or call 303-279-3113. Rocky Mountain Quilt Museum: 200 Violet Street, Suite 140. 10:00am to 4:00pm. 303-215-9001. Free gift with admission. Choice Insurance Group and Aspen Financial Strategies: 1510 Washington Avenue, between the Foothills Art Center & Sherpa House. 10:00am to 4:00pm. 720-771-0993. Are proud to host PAMPER, PRESENTS & PANACHE at the historic Unger House. Kick off your holiday celebrations with over twenty vendors who will ease you into the holiday chaos with great gift ideas and the opportunity to treat yourself to a little TLC. Our PANACHE includes clothing, makeup, jewelry and ways to maintain health, vitality and feel fabulous this holiday season. Stop by for some holiday cheer (muffins & mimosas) or treat yourself to a massage, and enter to win fabulous prizes. Baby Doe’s Clothing: 1116 Washington Avenue. 10:00am to 6:00pm. 303-279-8100. Homemade treats and warm tea served. Gold Mine Cupcakes: 700 12 Street, Suite 130. 10:00 am to 6:00 pm. 720-328-9531. Free mini spatula with Purchase. Spirits in the Wind Gallery: 1211 Washington Avenue. 10:00am to 7:30pm. 303-279-1192. Fused Art Glass and Hand Blown Glass. Christmas Ornaments available. Blue Moose Trading Company: 1299 Washington Avenue, Suite 110. 303-271-1199. 10:00am to 9:00pm. Super Sock Saturday! Socks are cool and we have lots. Come and stuff your stockings with socks! Santa Claus will be at Avenue Gifts, 1212 Washington Avenue, 11:00 am to 3:00 pm. 303-279-0200. 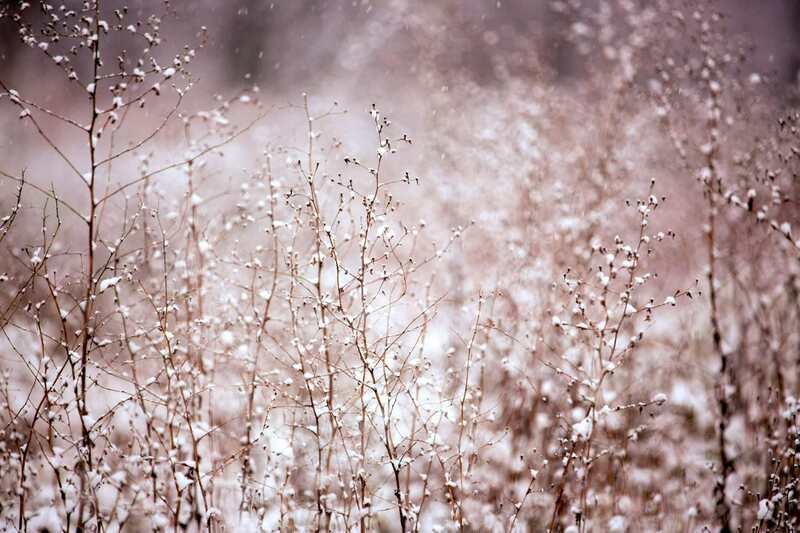 Bring your camera and make a great holiday photo. Gardner History & Preservation, LLC: 805 13th Street. 11:00am to 3:00pm. “2018 Historic Golden Calendar” Give the gift of history this holiday season with the Historic Golden Calendar available for $22.00 at Gardner History & Preservation throughout the year. oldnews@gardnerhistory.com 303-278-0900. Calendar also available @ Avenue Gifts thru the holiday season. 1212 Washington Avenue. 303-279-0200. Golden Concert Choir Presents Icicles & Carols: Wheat Ridge United Methodist Church, 7530 W. 38th Ave, 3:00 p.m. to 7:00 p.m. 303-747-7464. Tickets can be purchased online or at the door: $10/regular, $7/senior or student, $3/child, children under 6 free. goldenconcertchoir.org. 2nd Annual Aegis Professional Realty & Goosetown Events Family Christmas Party: 514 9th St. Noon - 3:00 pm. Delicious treats, hot chocolate & cider, wine and beer, pony rides for the kids and "Brooks n&apos; Friends" music on the patio. 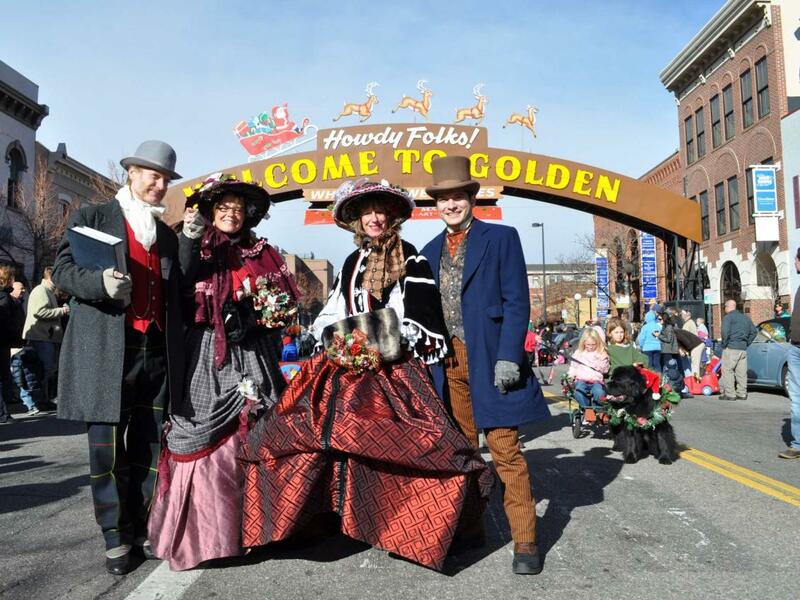 Golden’s Victorian Carolers will stroll the Avenue from 12:00 pm to 2:00 pm. Sponsored by the Golden Chamber. Golden Hayride & Gold Mine Cupcake’s: 700 12th Street, Suite 130. 720-328-9531. Free Hayrides each Saturday for 1 hour after the parades with Santa and Mrs. Claus. Pick up point is in front of Gold Mine Cupcakes. LifeStyle Realty & Consulting: 1111 Washington Avenue, Suite 212. 720-460-0289. 11:30am to 12:30pm. Will provide all the fixings for the kiddos to make their own personal bagpipes and lend the haunting sounds of their pipes to traditional Christmas carols and songs. Foothills Art Center: 809 15th Street. 1:00pm to 4:00pm. 303- 279-3922. Kids Crafts during (HART). Build Gingerbread Houses in Peterson Classroom - all welcome. Registration is required and space is limited. Gingerbread houses can be a bit tricky to build, and really fun to decorate. We have found a solution with cardboard structures and lots of decorating materials. Come and top last year’s creations. Oh Susanna Vintage Photo Parlor: 1117 Washington Ave. 11:00am - 2:00pm. 303-216-0877. Santa will be in the studio for the next 3 Saturdays following the Christmas parade from 11-2 for a gorgeous Santa portrait with your little ones! Cost varies. Free Horse Drawn Carriage Rides through Historic Downtown Golden. Sponsored by the Golden Chamber of Commerce. Pick up your ride on 12th Street between Washington and Arapahoe. 12:00pm to 3:00pm. Weather permitting. 303-279-3113. Spirits in the Wind Gallery: 1211 Washington Avenue. Friday 10:00 am to 7:00 pm. Saturday 10:00 am to 6:00 pm. Sunday 10:00 am to 5:00 pm. 303-279-1192. Large Array of Mata Ortiz Hand-coiled Pottery and Oaxcaan Hand-Carved Animal show. Pottery Demonstrations. Breakfast with Santa and the Christmas Showcase at the Calvary Episcopal Church, 8:30 am to 10:00 am at the corner of 13th and Arapahoe Street. Sponsors for this showcase are Copa Café, Golden Safeway and Ronald McDonald will be there! Bringing toys from McDonald’s restaurant. Additional sponsors are Mahnke Auto Body, Lifestyle Realty & Consulting, LLC., Golden Pizza Hut and Colorado Railroad Museum. Cellist Dr. Adam Riggs, recently back from a tour in the Czech Republic with Stratus Chamber Orchestra, will perform family-friendly holiday music from 8:00 am to 8:30 am. Santa Claus, Mrs. Claus, and Santa’s Elves will be there to provide Holiday fun. Reservations required. Cost is $10.00 for Adults, Children 3 to 12 $5.00 and Children 2 and under are free. No tickets sold at door. Purchase by: November 29th. Cash, Check or On-line for more information go to GoldenChamber.org. Foothills Art Center: 809 15th St. 2:00pm to 4:30pm. 303-279- 3922, ext. 106. Holiday Art Market artist demos. Featuring Sunny Monoco - Ceramics. Old Capitol Grill & Smokehouse: 1122 Washington Avenue. 4:00pm to 7:00pm. 303-279-6390. Santa Claus will be available to hear your Christmas wishes. Spirits in the Wind Gallery: 1211 Washington Avenue. 10:00am to 6:00pm. 303-279-1192. Pottery specials throughout the Gallery. Foothills Art Center: 809 15th St.2:00pm to 4:00pm. 303-279- 3922, ext. 106. Holiday Art Market artist demos. Featuring Dave Hawley-Wood. Gold Mine Cupcake’s: 700 12th Street, Suite 130. 11:00 am to 2:00 pm. Call 720-328-9531. To reserve your spot. The Golden Hayride is partnering with Gold Mine Cupcakes for this Elf academy opportunity. Old Capitol Grill & Smokehouse: 1122 Washington Ave. 4:00pm to 7:00pm 303-279-6390. Santa Claus will be available to hear your Christmas wishes. Spirits in the Wind Gallery: 1211 Washington Avenue. 11:00am to 5:00pm. 303-279-1192. Meet the Artist Randy Christensen, Silversmith. A Huge array of Villa Grove Colorado Turquoise Jewelry.